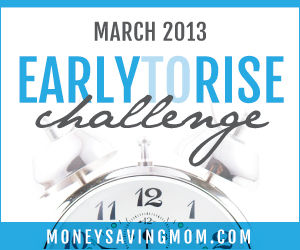 This is Day 16 of the Money Saving Mom Early To Rise Challenge! Today's topic was about bedtime. Something I need to learn. I have the bad habit of staying up way too late and feeling like I'm dragging the next morning. And I know this will happen when I make the decision to stay up late. 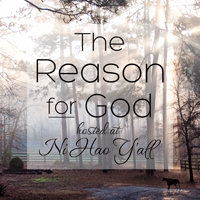 What am I doing most of the time? Usually it's nothing. Like 95% of the time, it really is just me and Pinterest or the TV that are burning the midnight oil. Why oh why do I do this to myself? The author gives some examples of what time he goes to bed in order to wake up on time. I think I'm pretty close, by half an hour or so. But today's challenge is to go to bed, as the book puts it "Stupid Early". As in, about an hour earlier. So instead of going to bed somewhere around 11:00-11:30 or later, I'll be going to bed hopefully around 10. This is actually a good plan, because that means D-baby will (HOPEFULLY!!!) be in bed by 9:30 ish. We've been inching up his bedtime for a few days now. and I think he would tolerate a 9:30 bedtime, though the eventual goal is 9 pm. So, what time did I get up this morning? 5:15 am. Not as good as some days, but that's to be expected.